Driving along the snaking A372 in Hampshire, many will have caught a glimpse of the towering steeple of Holy Trinity Church in Privett but few will realise that it was built for and funded by, Sir William Nicholson, gin distiller of London. Fewer still will know that William Nicholson, a gifted player of cricket, advanced Marylebone Cricket Club £18,333 6s 8d for the purchase of Lord’s cricket ground in 1864. Out of respect for such benevolence it is believed they changed the club colours from blue to the deep red and yolk yellow, the colours of Nicholson Gin. The stripe, so distinctive and known around the world as the ‘bacon and eggs’. Three Mills Newham where the Nicholsons distilled their gin. The 'bacon and eggs' stripe of the MCC. Magnificent reredos in Privett church carved by Farmer & Brindley. Yolk yellow and red repeated in the marble floor of Privett church. Red and yellow glass in close proximity. Memorial to William Nicholson Holy Trinity church Privett. Even the stonework in Privett church reflects the yellow and red stripes of the MCC. Memorial window to a brave Nicholson. William Nicholson surrounded by family. The striking interior of Holy Trinity church Privett. The towering steeple of Holy Trinity church. But it is not just the MCC that flourishes the colours of Nicholson Gin. Inside the church there is subtle reference to the Nicholson colours but more of that later. Bothers John and William Nicholson began distilling gin in Clerkenwell around 1802, supported by their cousin John Bowman, a distiller and brandy merchant. They eventually built their own business in Woodbridge St Clerkenwell where they re-distilled base grain alcohol, adding their own flavourings, including juniper, to make gin. 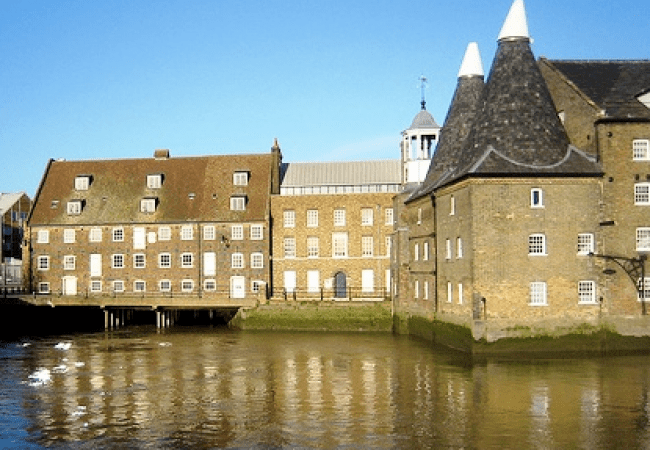 Not far from them, in Newham, was the Three Mills distillery and it was from here they probably bought their base alcohol which they would further refine. In 1872 they bought the three mills site and began to distill their own base product and produced their ‘Lamplighter Gin’. John Nicholson 1778 – 1846, passed on his share of the management of the business to his son William who was born in 1824. Williams first love was cricket. He played first class cricket with the Marylebone Cricket Club and Middlesex County Cricket Club and was hugely supportive of both clubs. In 1879 he became president of the MCC. When he retired from cricket he took over managenment of the distillery. William Nicholson’s talents did not stop there though. He was also a Liberal MP (later Conservative), who sat in the House of Commons between 1866 – 1885. In 1866 he was elected as Member of Parliament for Petersfield in Hampshire. William married Isabella Meek in 1858 and in fifteen years they had fourteen children. In 1863 William Nicholson bought the estate of Basing Park in Privett. The area at the time consisted of the big house, a small chapel and scattered farms. He proceeded to use his fortune and enormous energy to benefit the estate. He built the new church of Holy Trinity, whose spire is the tallest of any parish church in Hampshire, he built a vicarage and school next to the church and some workers cottages. He landscaped a park of 400 acres, with, of course, a magnificent cricket pitch. By the end of the 19th century the estate covered most of Privett and the neighbouring Froxfield. When William Nicholson died in 1909, the estate passed to his son William Graham Nicholson, who also served as MP for Petersfield. At the end of the 19th century, the London and South Western Railway proposed a new rail route, the Meon Valley line. This line would connect Fareham and Alton but William Nicholson, whose land it would traverse was less than happy about it. When the LSWR announced it proposed a station to be built on the Privett section and that the station would be called West Tisted, William Nicholson objected. He threatened to withhold transfer of the land unless the station was re-named Privett and so it was. He also ensured that Basing House would have a direct road link to the station, lined with ornamental trees, to enable the Nicholson family and guests to travel with least inconvenience, almost like having their own personal railway stop. Holy Trinity was built in 1876 by Victorian Gothic architect AW Blomfield. Just as the church steeple soars away 180 feet into the sky, so the interior is also majestic in height. It was built with local flint and Doulting Stone dressings from the Mendips. Different coloured stones are used in the interior. White bath stone in areas but it is the honey gold yellow Ham Hill stone and the red Cumbrian sandstone that caught the eye. Surely these are the colours of the Nicholson Gin distillery, adopted by crickets most prestigious organisation, the MCC? And then at our feet the yellow and red in the Italian mosaic floors and the mellow and subtle glass of the windows? The internal fittings of Holy Trinity were created by some of the finest Victorian craftsmen. The reredos is beautiful and was carved by the firm Farmer and Brindley of London, whose work included the Natural History Museum in London. Three of the stained glass windows are memorials to sons of William and Isabella, one of whom died saving the life of one of the workers at the distilllery. Read more about the heroism of Godfrey Maule Nicholson in another post. The village of Privett thrived all the while the big house thrived. In the mid 20th century the estate was broken up and in the 1940’s the house was requisitioned by the War Office and eventually in 1964 the house was demolished and a new house built. The era of the Nicholsons, gin, politics and cricket are a distant memory. The church is now open daily and cared for by the Church Conservation Trust. If you would like to know more about the Nicholsons and the gin distilling business they ran, then the National Archives hold a number of papers including some family wills. The Hambledon Cricket Club, the inspiration for English cricket. John Small was born in Empshott and lived in Petersfield Hampshire, becoming one of England’s greatest cricketers, leaving a legacy both in the game of cricket and in Hampshire’s history.